Music to love, hate, and everything in between. Remaining Calm in the face of 'The Celebrity'. So I have this new PR internship. The company I’m doing it with are absolutely lush. It’s only teeny tiny, but it definitely makes it more personal working for them. One of their current clients are a band called Her And The Colours, and after only having been there one day, I was lucky enough to attend the YouBloom awards a few weeks ago. YouBloom is an online competition set up by Bob Geldoff (silently screams) in order to hunt down proper talent. By proper talent I don’t mean girls in short skirts propped up against the bar down your local, but no doubt some of those did enter. No, You Bloom is aimed to tap into raw musical talent, the kind of talent that you don’t see on reality programmes such as The X Factor, or Britains Got Talent. So yes, a few weeks ago, one dark and windy Thursday evening, I trekked across London wearing my beautiful Topshop platform boots to the Cobden Club. Jumped off the bus at Kensal Rise and had 40 minutes to get from the bus stop to the venue. Ample time I thought, given that I hadn’t really thought through my footwear that morning, but they do look so good on. I was not in the least bit intimidated by several burly men on bouncer duty on the front door, but I did give my dad a ring to let him know that I was still alive, and my lifeless body hadn’t been flung into the Thames somewhere. He has a tendency to worry if I don’t check in when I’m out. Upon entering the venue I was delighted by the fact that my name was on the PR guest list! There was lots of screaming going on in my head at this time. Obviously I didn't shriek out loud. The likelihood of being thrown out is higher if you do that. I then proceeded to “gracefully” make my way up two flights of stairs, past the VIP bar, up to the room itself. In fact, I had made it in time to see Bob Geldoff himself (more screaming in my head) take to the stage to present the awards to the 2010 You Bloom winners. Actually they are the first winners ever seeing as it was only founded last year. Coincidentally, and I’m pretty sure that their nationality didn’t play a great part in their winning, but two out of the four artists that got first, second, third and fourth positions came from Ireland. Yeah, I’ll let you figure that one out. At this point I’d found a little corner to stand in, trying to blend in with the crowd (that primarily consisted of either muscios, musico jouranlists, PR’s etc etc) so when I say I was overwhelmed, that is a massive understatement. And as I stood in my little bubble of over - excitement and listened to the genius that is Bob Geldoff, I realised something. That this is something that I wanted to do for the rest of my life. I wanted to hunt down amazing bands and get them out there. Bob even said that finding new, different and brilliant artists was becoming somewhat of a rarity. The beautiful thing was, was that this competition had managed to find some of the cream of the crop. Second place went to a three lads from County Derry, known as Intermission. They sounded a bit like Muse had just thrown up Placebo, but this aside they were impeccable musicians. Their vocalist had a slightly whiny voice that reminded me somewhat of Tom DeLonge’s vocals for Angels and Airwaves, but after a few songs, it really started to grow on me. The bassist was divine, and I certainly heard no complaints from the crowd. In fact, looking around, everyone was having a fantastic time listening to their sound. Even the intimidating area right at the front of the stage got filled, so definitely a plus! The winner was Neev Kennedy. Heralding from County Galway Neev’s style was folk meets rock, and if Norah Jones and Katie Melua had a love child, this is what she would sound like. With beautiful, and somewhat witty lyrics, spot on vocal harmonies and a melody to die for, Neev Kennedy is certainly on the one to watch list. Actually one of her songs entitled Happy Song, was so crazily infectious, I was humming it all the way home. It also did exactly what it meant to, made me happy. Well, happier than I already was, and given the circumstances, that was saying a lot. Those were pretty much the two bands that stood out for me. I was still riding the adrenalin high that came with standing two inches away from Bob Geldoff himself!! I am absolutely certain that I remained cool and aloof: the perfect picture of professional. 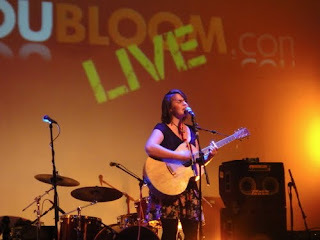 So yeah if you’re in a band, and you have a new sound and are finding it difficult to catch a break, then why not take a look at the YouBloom competition. What have you got to lose? There's even a cash prize for the winner! The Hat Factory. Probably the most overlooked and underrated music venue in the Beds, Herts and Bucks region. As I headed over there two Fridays ago I had a feeling it would be a great gig. Firstly because DTA promotions were running the show (and I’ve never been to a bad gig with them) and secondly because I know the venue well; I’ve played enough acoustic sets there to know that the staff are lush and the acoustics are not half bad. Gigs are primarily held in The Basement. Yes, you heard right. A basement. Minus the coffins and corpse like creatures, well, the latter is debatable I guess. As I headed down there I could feel a slight anticipation in the air. Partly because this gig had been hyped up for weeks, and partly because I’d also had a lot of coffee that day (you can’t study a degree without it, trust me). Doors usually open around 8ish, and I have to say, the room started getting packed pretty quickly. To be fair, this music venue, and this room in particular is not the largest. But this is what makes it so great. No matter where I stand, whether it’s right at the front, or in the deepest, darkest, crevice - like corner, it feels like I'm watching the bands from my front room. Albeit, without my comfy sofa and my dressing gown on. Cue Captain Dread. A pretty sweet band from Bedfordshire that kicked the crowd off to an incredibly strong start. I probably say this in every review that I write, but the first band do have an awful lot riding on their set; they set the tone for the rest of the evening and these guys certainly managed to do that just fine. With songs like Hurdy Gurdy and Captain D read, their sound is quite different from the generic picture people usually create with metal, especially the guitar intro to Simon Poons. Certainly a good opening set, and most definitely a band to watch. Swiftly following these guys were Ascension. Once more hailing from my own beautiful county of Bedfordshire. At one point during their set they broke into a metal version of Everybody Dance Now. I have heard many covers done by metal bands over the years, but never a dance track. This absolutely made my day, I actually turned to the person standing next to me (I never did get your name, lovely to meet you) in awe, and said how awesome that cover was. With bass lines to die for, an awesome vocalist, and a sound that made me want to stick them on repeat, you would be stark raving loony if you didn't get on to their facebook page and like them straight away. Our penultimate band were Hitchin lads Brave The Moment. Their set was mind blowingly good. Apparently this was their first gig with their current line up and you would not have thought it in the slightest. Their lead guitarist was wonderful to watch play (also very easy on the eye) and their vocalist rocked harder than a geologists convention on crack. It is a lot harder to scream than people realise, and I was genuinely impressed. In fact, I was nodding my head so forcefully in time to the beat that I’m pretty sure at one point I got whiplash, that was how freakishly addictive they were. I predict these guys will be playing at much bigger venues within the next few years, and you will kick yourself if you don’t go to one. And for the finale were Fall Against Fate. It was an absolute treat to see these guys perform for the first time, after having interviewed them a couple of months back. (The interview is on here, if you want to read about the pillow fights in their underwear!) Walking on to a dimly lit stage, to an incredibly entrancing and hypnotic accompaniment, built an incredibly climatic atmosphere. At this point I was standing pretty close to the front of the stage, so decided to safely retreat to a corner somewhere as I saw several guys, much larger than me, muscle their way to the front of the crowd. This meant only one thing, and the last time I was in a mosh pit, some evil so and so almost broke my nose. I was not having a repeat of that, because casualties, no matter how minor, seriously affect your ability to watch a band play. Fall Against Fate’s entire set was everything I would expect from such dedicated and talented musicians, and more. Their ability to mix the most beautiful, melodic sounds in with killer riffs and strong bass lines is something you do not get from your average mainstream band. Their stage presence, and ability to pump a crowd, is something you would expect to see in bands who have been performing for much longer than a few months. I strongly recommend you go and see them, whether it’s at a local venue now, or a massive arena in years to come. These guys are going places, and are making metal accessible to everyone, everywhere. I always judge how good a gig is by how much I need to go out and smoke during a bands set. I didn’t have to go out all night (apart from between bands) so kudos to you all. I was wonderfully impressed. So if you think any of the above bands sound like your cup of tea, then head on over to their myspace pages. The links are here for you so you don’t even have to do any of the hard work. If you really like what you hear, then add them on facebook, and if you don’t trust my opinion (tut tut) then head on down to one of their gigs yourself, and make up your own mind. Metal is making a massive comeback, so you can either sit on the sidelines and wave as it passes you by, or jump on up and try crowd surfing. I hear it’s fun. I’ve always wondered if it is just me who associates certain songs (or a certain genre of music) to memories, or past events, people and places. They can be both good and bad associations. For example, all I can really remember listening to from the age of seven to eleven, were The Spice Girls. I suppose that’s typical of a 90’s child. Then my father introduced to me to Dire Straits and the musical genius that is Mark Knopffler. Listening to Brothers In Arms for the first time was like awakening from a coma; everything I was hearing was so new and fascinating. Now, whenever I think of my dad, that album always comes to mind. Sub consciously of course, I’m not a total weirdo. I am currently going through bad associations. I cannot listen to The Cribs without wanting to stab someone. Fortunately for me this is socially unacceptable. But until I find a way to remove only certain songs from my iPod without wiping the entire thing, my soothing solution is to quickly put on some Iron and Wine, or if I’ve had a million cups of coffee, some Tim Minchin. As much as I love Tim, it really is not the best idea to listen to him on a commute to London at 9am. British people are prudes by nature, and do not really appreciate having someone uncontrollably laughing with hysterics sitting next to them. Especially if they can faintly hear the lyrics to a ‘Peace Song for Palestine’ coming out of your headphones. Not exactly PC is Tim. Trying to suppress a laugh mid flow is even worse. You know when you do that bent over double act, and your face squishes up tight. Not exactly the most attractive thing commuters want to see just after they’ve eaten breakfast. I am hoping, however, that this is merely a phase I am going through, and will end pretty quickly. The Cribs are an amazing band and I seriously want to have their metaphorical babies. Move over Kate Nash. Saying that though, I still can’t listen to Ash without wanting to throw up (some real bad memories there), and that’s almost been four years. This hasn’t actually been a tragic loss, and is a blow that I have actually embraced, more than anything, with open arms. To lose The Cribs however, would mean that one of the only British Indie bands that I genuinely appreciate would be missing from my life, and I just cannot allow that. My long term solution: deleting them from my iPod would be like stabbing my own eyes with a fork, and then pouring salt into the wounds. Instead I intend to force myself to listen to them until I have re - associated them with different memories; ones that don’t potentially involve being arrested for GBH. I am not, by nature, a violent person. I thought I’d never live to see the day I’d say this, but, ladies and gents, metal is making a comeback. Slowly creeping in from across the pond with bands such as We Came As Romans and Periphery, the metal scene is spreading it’s wings across Blighty’s shores. Fall Against Fate, Hertfordshire’s answer to Slayer (though they’d probably protest if I told them that), are an awesome up and coming metal band. With epic intro’s, crazy guitar riffs, and a beat that would make even David Cameron dive head first into a mosh pit, these are a band that you definitely need to keep your eye on. I caught up with Tom Saunders and Paul Wood a few months ago, Fall Against Fate’s two guitarist’s, to see what they had to say on making it big in the industry; government cuts to Higher Education; Toni and Guy haircuts; and pillow fights in their underwear. Hi guys, nice to meet you both, so Fall Against Fate is a catchy name.Tell me a bit more about yourselves, how did you all meet? It started as a mess around with myself and a few friends. Eventually we realised we wanted this to be more than a mess around, so we introduced a vocalist and started jamming. Since then we have had a hell of a lot of line up changes, whether it be down to commitment issues or simply loss of interest; we have lost members and gained members. But we have finally found a solid line up that produces the exact sound we have been searching for. I met Paul whilst on tour with Versus Akira. I met Ross (vocals) from College (we were on the same course together) I met Dave (drums) through Ross. Lewis (bass) has been my best friend for many years now, he was there from the beginning also. I joined just as Versus Akira were splitting up...the line-up at the time wasn't great, but I could see what Tom was trying to do and that there was loads of potential. me and tom = endless banter, god knows what it's gonna be like on our next tour. But I LOVE non PC! Haha alright, so are you all students? Me and Dave are…Tom’s just finished a music tech qualification. Dave is a student at Guildford, I just finished a National Diploma in Music Technology. You’re all dotted around the place, that must make life quite difficult…. Myself, Lewis and Ross all live in Watford. Dave travels back from Guildford every week for a practise. We usually practise 2 or 3 times a week, and Paul hails from Luton, so once he comes back we just trade off each other, as we have near enough the same studio set up. That’s pretty awesome, not a lot of bands can say that they are that finely tuned to each others wants and needs, how long has your current line up been together? Around 3 months now I feel. We've been out of action for a year. We wanted to take a time out and "re vamp" the band, people weren’t pulling their weight, lack of committed etc... as I mentioned earlier. We had a vision of what we wanted the band to be like, and we have now achieved that I think. You guys are so far from the mainstream acts that are around at the moment, where are you getting all this inspiration from? Yeah we are highly influenced by the American scene. It's extremely refreshing. 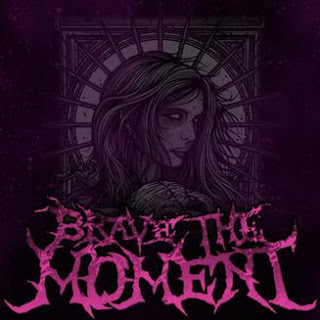 Bands such as: We Came As Romans, August Burns Red, Woe, Is Me, Blessthefall, Chiodos, Miss May I, Volumes, Periphery. A lot of the bands are slowly becoming our friends also which is rad. I love Woe Is Me, and how they use electronic sounds on top of riffs similar to ours, we haven't gone in that direction with the electronic layers... Yet. I think the main issue the majority of people have with metal is that it isn’t what you would call easy listening. Would you agree? Yeah definitely, it's a bit of a stumbling point, but that's easily overcome with a bit of thought. We try and keep a sense of groove in our song writing. Metal's such a huge genre, there's a lot of bands i'd say are easy to listen to, but it's a case of finding them or having a friend introduce you to ‘em. I personally got into metal and more heavier music due to the excitement it I filled with, there are build ups, massive epic drops and changes that you just can't get in some music. Like you wouldn't have a dance track suddenly drop into a massive beatdown. BUT you would have a massive beatdown drop into an electronic/dance section, and it works. We got our first physical USA release out for this record. We managed to get it sold in a Target store in the USA. The first "batch" sold out within the first day which was so overwhelming for us personally. You’re doing this all by yourself? Guys, you have just inspired hundreds of people struggling in bands out there. It's surprised me how many places a band can get their stuff into, without being signed to a major record label. So what advice would you give to a non - mainstream band trying to make it? I'd say be happy with your sound, no matter how long it takes before you show it off at shows and on CDs etc. It was hard for us, but i don't think we'd be anywhere near as happy with how we're sounding if we'd just 'made do' with where we were going, say, 6 months ago. It takes work and patience and time. If you just keep on pushing your band and finding new original ways of pushing your band then you WILL get noticed. Don't just think an email will do it, companies have phones for reasons, use them, they can't run away from you when you're on the phone to them or face to face with them in their office. And I am so loving the drums, especially on the intro’s, I find intro’s really make or break a song. Me and tom worked on the drums for probably the last 13 months haha…Dave is also a beast for carrying that into our live shows. Haha oh god no, it’s not like that. Nah, we are endorsed by Toni and Guy haha, I think that says it all. I think we are all loving the sound of that. But Paul, being at university yourself, how do you think the government’s plans to cut Higher Education will effect the nation? It's gonna cripple the nation. They seem to be doing everything they can to tell people they were good for the country this election term but this will show itself over the next generation, when labour or whoever else is in power and then we'll be lacking higher-level workers, and moaning once again. You’re definitely not wrong there. And final question, what do you all do for funsies? I hang out with Tom and Lewis a lot. Ross and Dave are new, so I don’t know them as well, but they seem sound. I stay over at Lewis’ a lot, so typical guy sleepover stuff. Well you heard it here first guys. 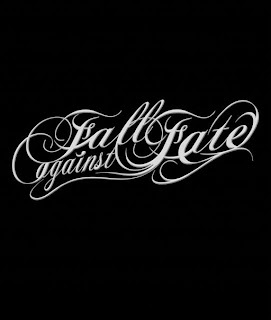 Fall Against Fate has several tbc gigs lined up for 2011, so get on their Myspace, Facebook and Twitter to check out their latest events, buy some merchandise or even just to say hi. You can even buy their EP at Tesco’s online, Itunes, or even Spotify them. You’d be crazy not to miss out on this wonderful up and coming band, definitely keep your eyes on them in the next few years.